The most electrifying dance I ever saw was a 1999 performance of "Cool Hand Luke" - a piece Bob Fosse originally created in 1968 for Gwen Verdon to perform on the Bob Hope Special. (Got all that?) I had given up any hope of seeing the piece again until thanks to the miracle of You Tube - I found not just one but two clips - each only viewed by about 300 people! The first is from an un-named and un-located rehearsal, and in spite of the mildly shaky camera work I like the rawness of this rendition. The second is from a t.v. recording of the Broadway musical "Fosse". Bob Fosse died young (age 60), and while his choreography and trademark turned-in, finger-snapping style created a bridge between modern dance and Broadway, the more time passes the more it looks like high art. Fosse became a choreographer when premature baldness ended his career as an actor and dancer, and apparently his trademark use of hats as props came from his self-consciousness about his own appearance. 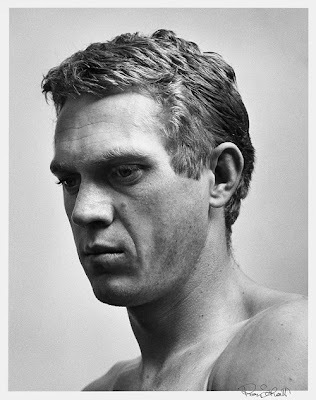 He had an interesting life, remaining married to Gwen Verdon long after they separated and through his relationships with Ann Reinking and Jessica Lange. As a film-maker he was also no slouch. His 1979 "All That Jazz" won four Academy Awards and was nominated for Best Picture and Best Director. Fosse's last film "Star 80", a 1983 biopic of Dorothy Stratton got mixed critical reaction at the time (although Richard Schickel of Time and Rex Reed gave it rave reviews) but has since acquired a strong cult following. 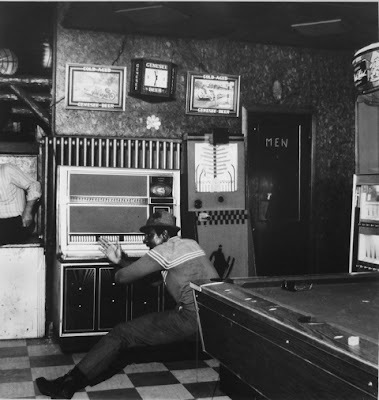 I'm always surprised that the greatest hits of photography still make it into every auction sale and continue to fetch record prices - one would think there would be a law of diminishing returns. But at least this mentality offers the more adventurous collector a great opportunity to pick up bargains. The nice thing about the auction catalogs that come to me regularly (from both the well-known auction houses and places I've never heard of) is the inexhaustible supply of fresh images. 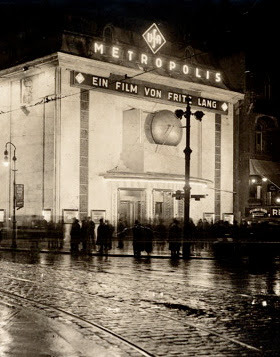 The photographs below come from the Bassenge Auction to be held in Berlin on December 5. 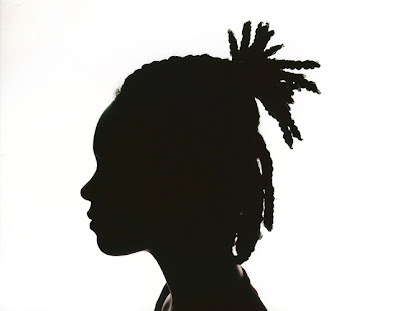 The picture above is not a Kara Walker. It's a Katharine Wolkoff commissioned portrait. If you look closely around the neck you might be able to see that it's actually a color photograph. Katharine devised the complex lighting set-up for these silhouette portraits a few years ago and they have since been acquired by museums and collectors. She does her own printing - a rarity these days - and her prints are stunning. A 2002 Yale MFA graduate, Katharine refuses to be pigeonholed and her two latest projects were a look at post-Katrina New Orleans in the context of the Southern landscape, and a special issue of 2wice Magazine where she photographed the Merce Cunningham Dance Company in the grounds of the historic Vizcaya estate in Miami. Two pictures of the Louvre. 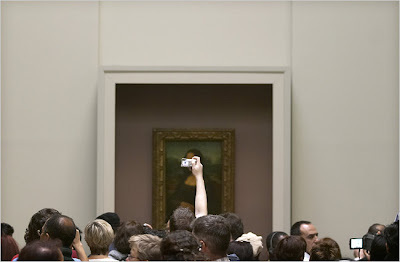 The first appeared in the New York Times illustrating an article about how the Sarkozy government is considering making all museum entries free. 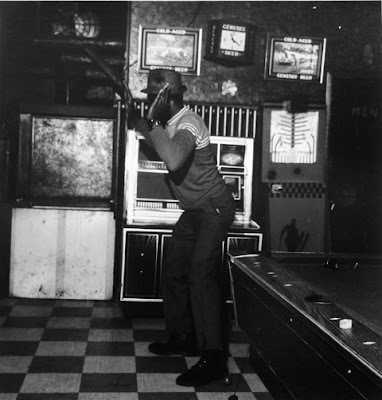 The photographer, who I have not previously heard of, is Ed Alcock. 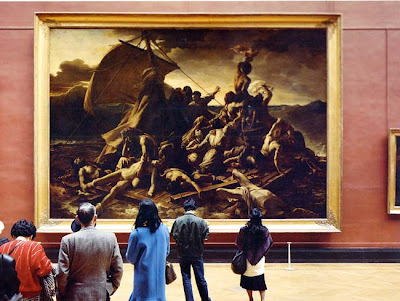 The second is from Thomas Struth's famous museum series. I like them both in different ways - the Struth because it is so deliberately and thoughtfully conceived, and the Alcock because it is unwittingly artful. With MoMA admission now infamously at $20, the free admission idea seems timely and is already working in England where there has been a 50 percent rise in attendance recorded since the measure was introduced in 2001. An intelligent alternative is the Metropolitan Museum's where there is a "suggested donation" of $20, but you can pay nothing if you wish. An even better idea for improving the quality of American museums - get the curators and directors out of their chairs and offices and into the streets, galleries, studios, and schools. There was a time when the photography directors of the New York museums would regularly come to galleries, but this is now a rarity and all are the poorer for it. One of things I love most about You Tube is the dazzling variety of versions, tributes, iterations, etc. of any given subject. You start at a given point and then move laterally or haphazardly around, mining for gold. This summer I landed on the song - "Hey Boy" by Teddybears STHLM - a Swedish rock/electronic band. (Never heard of them? Neither had I, but according to their Wikipedia entry Iggy Pop and Neneh Cherry guested on their last album.) Anyway, from there it was just a hop to CutieMish whose tribute clip while having a superficial similarity to Laurel Nakadate has now been seen over a quarter of million times (compared to Teddybears' 78,000 views) and made her the kind of You Tube celebrity Andy Warhol would have loved. Apologies for the four letter words that open her clip but enjoy the shooting, editing, and energy. It's conceptual and somewhat insidery but Khan's pictures are powerful, original, striking, and usually quite large. Strangely he does not seem to have made a huge impression in the States yet in spite of shows at Fraenkel in San Francisco and a recent three week show at Yvon Lambert in New York that came and went without notice. 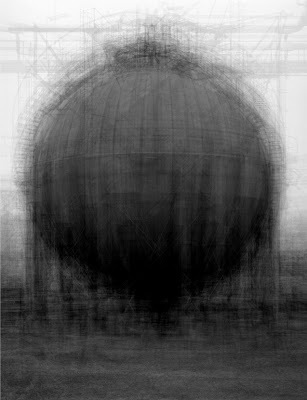 Here are three more images - "Every ... Nicholas Nixon's Brown Sisters"; "Every... Bernd and Hilla Becher Spherical Type Gasholders"; and "Every ... 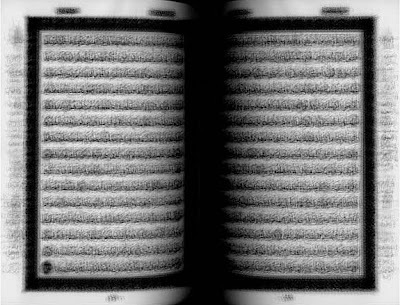 Page of the Holy Koran". Not every much photographed beauty becomes a muse. In fact we seem to be somewhat short of muses at the moment, at least compared to the 30s and 40s and subjects like Lee Miller, Charis Weston, Lisa Fonnsagrives, and Eleanor Callahan, not to mention the movie stars photographed by Hurrell, Bull, etc.. But if asked to identify the muses of our time I would have to pick Jessie Mann and Kate Moss. 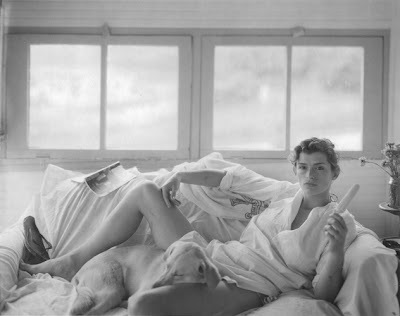 Jessie, as most people know, came to fame as one of Sally Mann's extraordinarily striking family. Jessie has written about the pros and cons of being so much and so controversially in the public eye, but she got the bug and re-emerged a few years ago to begin a collaboration with Len Prince in which she is both the subject and co-author of the images. 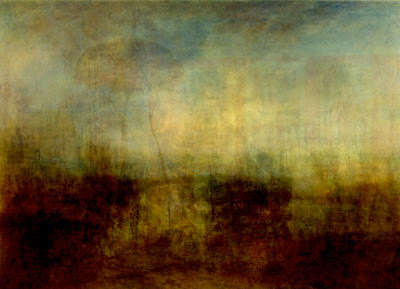 A show of their recent work just opened at the Fay Gold Gallery in Atlanta. Here is a picture that's so new it's not even in the show, but combines the best of three worlds - Mann and Prince's collaborative art direction, Prince's technical photographic skill, and the updated classical/pictorial tradition begun by mama Sally. Kate Moss (who I'll try to refrain from writing about too often) has a presence that seems to inspire every photographer she works with to great heights. There is something inherently non-commercial in her look so that pictures of her appear more artistic than advertising or editorial, and she's never vain. Anyway, here are a 1996 Irving Penn shot and a 1994 Paolo Roverso polaroid - both coming up for sale tomorrow at Phillips in London. The Penn is estimated at $30,000 - $40,000 and the Roversi at $3,000 - $5,000 - which would certainly qualify as my steal of the week. In the tradition of Alec Soth's Friday Poem, here's the inaugural Weekend Video. It's Van Morrison's version of the Stephen Sondheim chestnut "Send in the Clowns". The trumpet player in the foreground is Chet Baker. 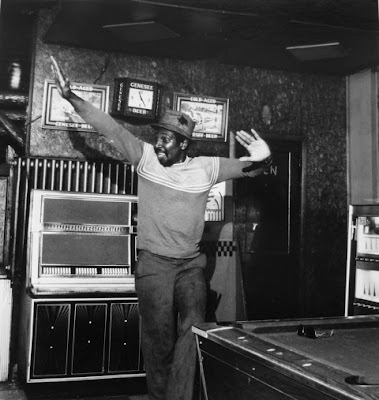 It was recorded in London at Ronnie Scott's club in 1986 and turned out to be Baker's last live performance. There are two downloads of the clip on You Tube but as it's music, I chose the one with better sound and lesser picture. 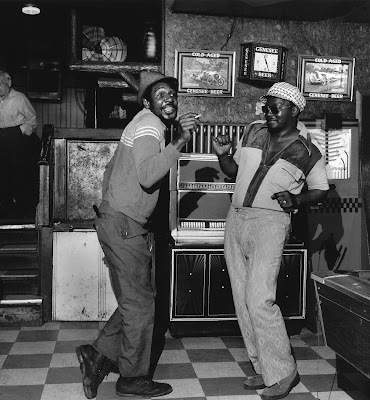 The big hit of the Milton Rogovin exhibition "Buffalo" currently up at my gallery has to be this 1973 picture of Lower West Siders Johnny Lee Wines and Zeke Johnson. "It's a picture of pure happiness" said one viewer. So to spread the feeling, here are some unpublished and unseen shots of Johnny from that day. Rogovin's shot also brings to mind another of my favorite pictures that blends happiness, romance, and a certain bashfulness. 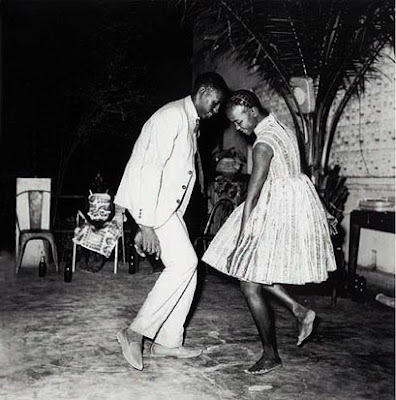 This great shot by Malick Sidibe. Last Tuesday I was in London for the Christie's Photographs auction and had the chance to sit through the entire sale, something I rarely do. There's something hypnotic and surreal about the drone of numbers, but it puts you in a good trance-like state from which to contemplate photography and the photography business. 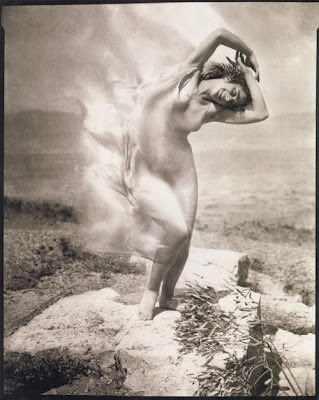 A gorgeous vintage print of Edward Steichen's "Wind Fire -Therese Duncan on the Acropolis, 1921" went for $70,000. To my mind one of his masterpieces and the steal of the sale. In today's market an extra zero would not be out of place. 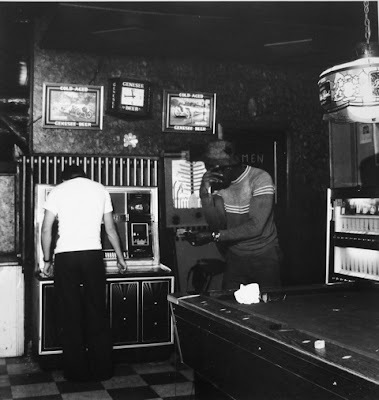 Meanwhile a picture by Dieter Blum, one of the original advertising photographers for the Marlboro Men campaign estimated at $30,000 - $40,000 went for $100,000. 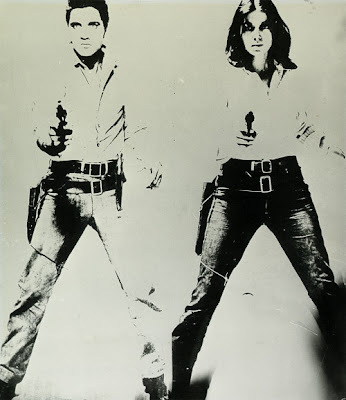 Still nothing compared to the $1,248,000 fetched by Richard Prince's untitled appropriation - the picture currently holding the auction record for the most expensive photograph. Today's art market clearly and unequivocally believes that the conceptual trumps the literal and it seems unlikely that this perspective will ever change. 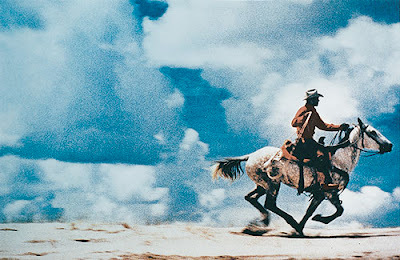 But would it be interesting to do a show based on the original Marlboro images by the original photographers? While nudes always seem to do well, Helmut Newton (about whose work I've always had mixed feelings) had an up and down day. This pair of pictures, which I think would look pretty good in a racy summer house, were also estimated at $30,000 - $40,000, but went unsold and as of now are still available. When I'm on the road and am asked what I do, the follow-up question is inevitably "What's your favorite photograph?". And while I should have a ready answer I'm usually stymied as I take the question very seriously. Thinking about the question in the context of this blog, I realize that the subject I've been most often drawn to is the sky. It's easy to take obvious sky pictures so people who re-invent the genre really stand out. 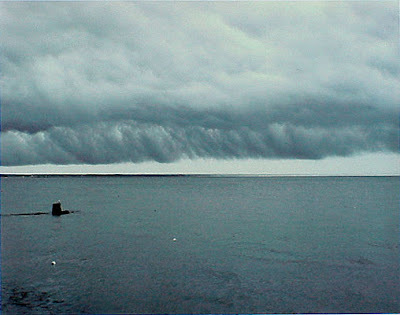 Eliot Porter, whose cloud pictures I opened my first gallery with in 1989 was a secret sky-taker. 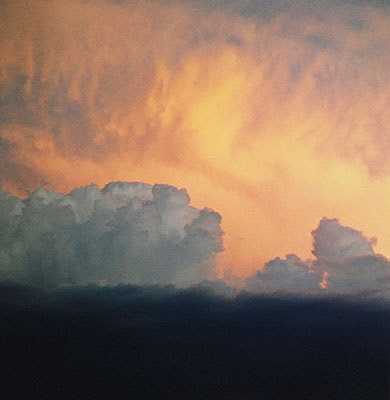 I had seen several cloud pictures in his 1987 monograph and wrote to him in Santa Fe asking if there were more. I was graciously invited out to his studio, and there Porter pulled down box after box of cloud and sky pictures, literally hundreds of individual dye transfer prints one more beautiful than the other. He had been hoarding them for decades. Six years later I had the chance to put up the first exhibition of Richard Misrach's Desert Canto XVIII - Skies. A series of unique 40 x 50 inch prints of western skies, the pictures were pure color abstraction that always made me think of Rothko. I remember saying at the time I could have left that show up forever and I'm sorry no De Menil came in to buy the complete set and install them in their own space. However, I did get one for myself that hangs in my home and gives me enormous pleasure. Joel Meyerowitz's "Bay/Sky" series chronologically both predates and outlasts Sugimoto's (different but still great) horizon series although Joel is rarely given the credit. However, when he started his Cape Light work in the mid 1970s, he was really the person who set in motion the return to large format photography as well as being the first committed colorist of the '70s. 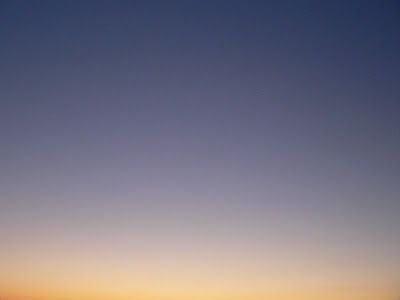 One last sky picture that has given me a great deal of pleasure is this picture by Florian Maier-Aichen. (At least I feel it's a sky picture.) 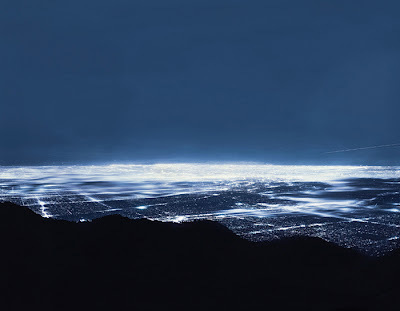 A photograph of Los Angeles at night, it has been my laptop background for several years and I've never felt the slightest need to change it. When I sit down and open a magazine or newspaper, there's always the hope that some unexpected gem of a picture will pop out. 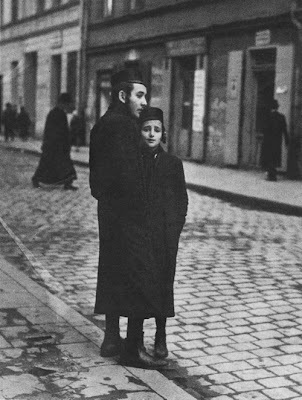 This anonymous picture, taken in the Warsaw ghetto in 1941 just appeared in the New York Times book review section and I think it would be hard to find a more powerful image. The expressions of the man and boy, their clothing, the unusual composition of the figures in relation to each other as well as to the receding street and the figures behind them combine with our premonition of their fate. How did the photographer manage to take this picture? What did he say to the subjects? They’ve obviously consented to be photographed but they seem far away from the experience. 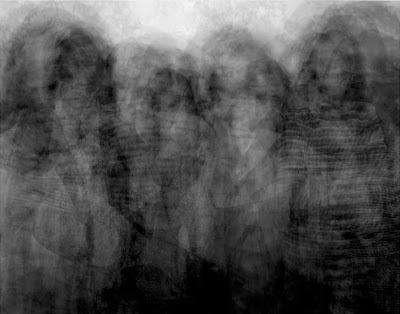 The picture uses a compositional device that four of my favorite photographers - August Sander, Richard Avedon, Alex Soth, and now - The Sartorialist – often use, viewing the full figure but from a distance, the subject weighted towards the bottom, often against a diagonally receding ground. Is it just me or does it seem to work every time? This blog was inspired by such blogs as Conscientious, The Sartorialist, and Alec Soth's late and much lamented blog (although it's still up so you can read back posts). It's about a love of photography and the pleasure I get from finding good pictures. 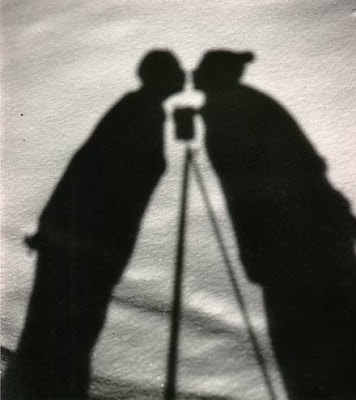 The photograph above is by Alfred Eisenstadt of himself, his first wife, and his camera - the last of which turned out to be his greatest love.